Do you ever feel like you are constantly decorating a space in your house? 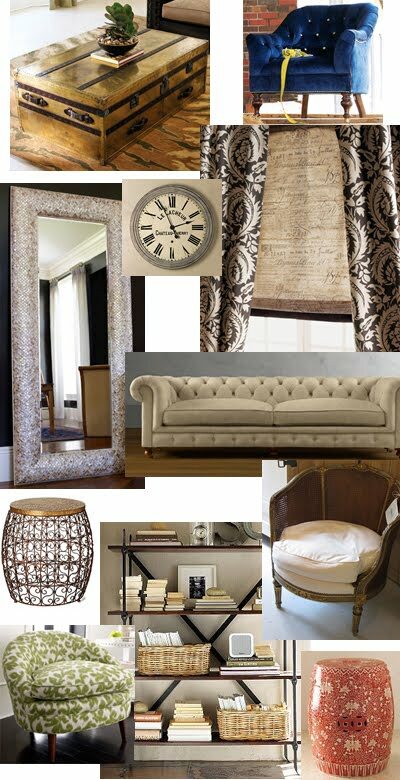 Or at least thinking about redecorating a room? I feel like I am constantly saying, "Oh, this armoire would look great in the guest room" or "these drapes would be perfect for the kitchen window" or "we NEED that sofa in the tv room." I know I drive my husband crazy by saying these things cause he just rolls his eyes whenever I start a sentence with, "that would look great in the..." Well, he doesn't really roll his eyes, but I know his initial thought is where is the money coming from? And he's right. It's not like we've got a money tree growing on the deck, but you know what? When you have an idea, or final vision of what you want your room(s) to look like, it's a great start to finding pieces inexpensively. Since you know exactly what you want, you can always keep your eyes out during retail sales, flea markets, yard sales, Craigslist (a great resource), or you can save for that investment piece. Knowing exactly what you want will help you cut costs. I'll be the first to admit that I have not lived by this process because I never really hunkered down to map out what each of the rooms in my house should look like. But after watching all of these design shows and reading how professional designers map out the plans of their clients' rooms, I figured I should take a cue and follow suit. I mean, if the pros do it that way then why can't I? And people, I now know why they do it that way. There's a relief in knowing what the final look is (no more stressing about it) and you can start hunting for deals on the pieces you need. Obviously, not all pieces can be found on the cheap (lucky you if you do) so certain pieces may be an investment instead. Now, I'm not trying to discount the idea of purchasing items on the fly because that makes the item spontaneously personal and you never know what you'll find during shopping trips. But my husband and I do a lot of spontaneous purchasing of furniture and decor items and it would just be so nice to be buying items we know would get things crossed off the list. Hence, the image above. I finally mapped out the living room with all of the ideal pieces I would want to have to furnish the space. And surprisingly, my husband is all for it! Obviously, I left out the many accessories that will fill in the space since if I had added that then this would be a forever-long post but I just wanted to start out with the major pieces first. What do you guys think? Fail to plan... plan to fail.